Hard to tell in the picture, but the snow is going sideways! 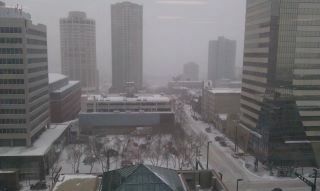 I can normally see across the river, but today it is all white. It is windy and cold, and I am not looking forward to the commute home later! This is definitely a good day to leave early. If you must be out in this today, please, PLEASE, PLEASE drive carefully! Hard to believe it is only 6 weeks til Christmas! In fact, 6 weeks from today is Boxing Day! 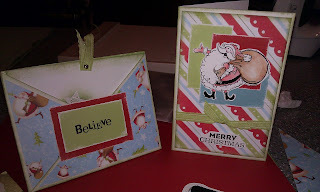 To get a start, I am holding a Christmas Card Workshop on November 26 from 9 AM to 4 PM. These are two of the cards we will be working on. 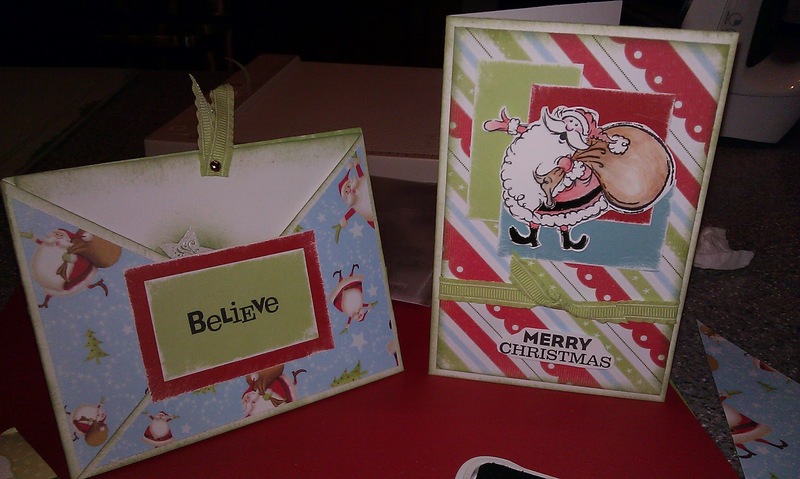 ﻿They use the new Believe paper pack, which I LOVE! There are also two other cards which use the Wonderland paper pack and one more which uses Believe, but I am keeping them a secret until the workshop! Suffice it to say, they are beautiful! I can't go without mentioning the exclusive Holiday Wishes stamp set. It is only available for the month of November and has some beautiful images, most of which are compatible with the Cricut Close to my Heart Art Philosophy cartridge! When you place a minimum order of $25 in My Acrylix® stamp sets in November, you can purchase a new D-size Holiday Wishes stamp set for only $5! That’s significant savings off the full retail value of $19.95 CAN. If you are in the St. Albert, Alberta area and would like to host a booking at your home or mine, and receive scrapbooking and stamping materials for FREE, please go to my website at http://worksofheart.myctmh.com/ and send me an email! I would love to show you and your friends how to preserve your memories for generations to come, and how to make stunning cards for all occasions!